In its best moments, “Ghostbusters” achieves a smarmy, winking charm — until the film realizes that it’s gone off-script and hastily reorients back to the preordained narrative. The talented cast of comedians and actors that director Paul Feig has rallied to his cause is ill-served by limping dialogue and a weak-chinned plot. “Ghostbusters” isn’t bad — no, that would be all too simple — it’s perfectly acceptable, perfectly predictable and rather dull. And that’s a shame, because hidden somewhere inside the lumbering mess is an earnestly fun summer movie. Kristen Wiig returns to screen as the skittish Dr. Erin Gilbert, all wide eyes and hidden disappointment. Wiig imbues the tired physicist with sly humor; after all, where else could she spout lines about proton streams and polarity? The good doctor has been chasing after an increasingly illusory tenure at Columbia University, only to be blindsided by the worst of shames: scientific quackery, in the delightful form of her self-published guide to ghosts and ghost-hunting. Her erstwhile high school friend, Dr. Abby Yates (Melissa McCarthy, overflowing with good-natured boisterousness), has released the book into the wilds of the internet, guaranteeing Erin’s scholastic damnation. Despite herself, Erin is soon drawn back into the world of supernatural super-geekery. 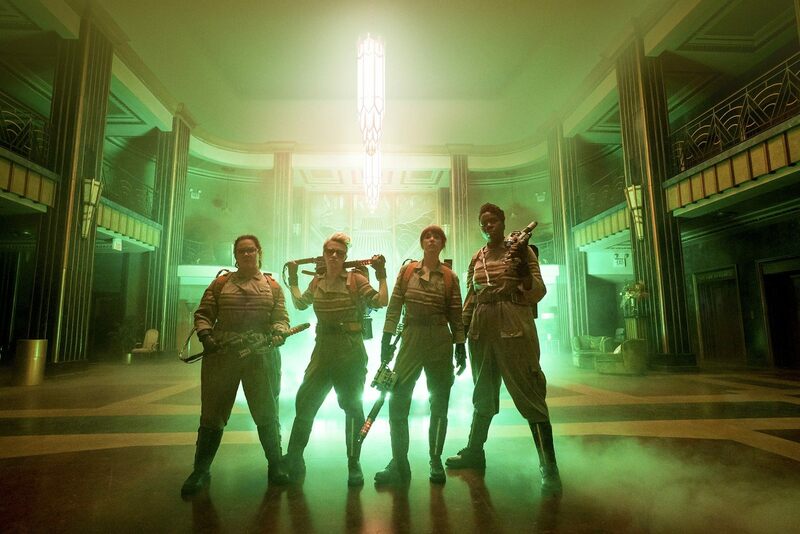 Joined by mad engineer Jillian Holtzmann (Kate McKinnon) and local history-buff Patty Tolan (Leslie Jones), the ladies form a formidable group of ghostbusters. They even score a secretary — Chris Hemsworth masquerading as the improbably dim Kevin, whose antics and woeful incompetence are only superseded by his attractiveness to Erin. When trouble comes a-knocking, the gang is ready to respond, crashing a rock concert and blasting evil ectoplasmic-intruders with juvenile glee. The graphics, despite their poor quality, are appropriate to the childish, antiquarian thematics of of the narrative, and are a balm to older viewers, who may remember the original films with sighs of nostalgic content. And the villain, a Saturday-morning-cartoon caricature, harkens back to a certain brand of ’80s jee-whiz corniness. Thankfully, he’s spared an accompanying mustache and cane. The new ghostbusters’ performances are impassioned and well-delivered; each exudes almost palpable conviction and zeal, as befits a zany bunch of scientific maniacs, but Feig doesn’t return the favor. He delivers the material in such a bland package that it’s hardly worth the effort put in. Sure, Feig successfully swipes the evocative original’s aesthetics, but it’s a loss that he couldn’t also borrow Dan Aykroyd’s excellent ear for banter. Films inevitably pilfer the cultural treasure-trove for tropes, but adorn a piece with too many and it will be weighed down. Why invest in such a gifted entourage if you aren’t going to put them to good use? The story is awash with stereotypes and hackneyed one-liners, and self-aware tawdriness isn’t a sufficient apology.